On this episode of The Innovation Engine, we examine the dearth of female leaders in technology and look at ways we can mentor and encourage more female computer scientists. Among the topics we discuss are a new curriculum at Northeastern University, how that curriculum is evening the demographic playing field, and whether there really is a difference between women and men when it comes to their interest in Computer Science. 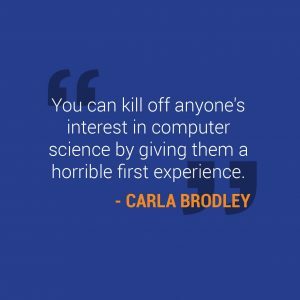 Our guest is Carla Brodley, Dean of the College of Computer and Information Science at Northeastern University. Dean Brodley’s interdisciplinary machine learning research led to advances not only in computer and information science, but also remote sensing, neuroscience, digital libraries, astrophysics, chemistry, evidence-based medicine, and predictive medicine. She’s currently serving on the board of directors of the Computing Research Association (CRA), the Executive Committee of the Northeast Big Data Hub, and as a member-at-large of the section on information, computing, and communication of the American Association for the Advancement of Science (AAAS). Why are there fewer women than men in Computer Science? The best way to encourage women to take computer science, frankly, is to make it required, but that doesn’t always work in most universities because every college and every Dean would like to have their classes be required. Why’s that the best way to do it? Carla found, both as a Dean at Northeastern and a department chair at Tufts, that women and men who try computer science, who have never had it before, like it in exactly the same percentages. So 75 percent of people at both Tufts and Northeastern who’ve never taken computer science before love it enough to take the second course, and then typically 75 percent of the students who graduate that course love it enough to major. There is absolutely no difference in those percentages for men and women. At Northeastern, they have created a number of combined majors. That turns out to be extremely attractive to their students, both men and women. In fact, more than half of their computer science majors are doing combined majors. Northeastern also piloted a Master’s program for people who have never taken computer science, which has been quite successful. People who majored in subjects like English, political science, history, economics, literature, theater, chemistry are coming to this program, and companies seem to like hiring these students. If you like what you hear on this episode of the podcast, please help us spread the word about it using the Click to Tweet feature below or the social share icons at the bottom of the post. Jennifer Ives is the SVP of 3Pillar’s Technology industry team. Jennifer is a seasoned business leader who has 20+ years of experience working with technology companies to help fuel strategic growth. Over the course of her career, she has worked with technology companies that range in size from startups to Fortune 500 companies. She oversees a team at 3Pillar that works with a diverse portfolio of clients and includes software, security, and venture-backed startup companies.